Technology: Resin Transfer Molding Services are composite parts manufacturing services which use low pressure closed-mold fabrication techniques to produce parts of carbon fiber, aramid fiber, fiberglass, etc. The molding process produces products with a smooth finishes on both inside and out. 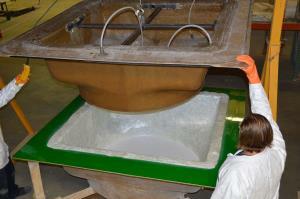 Resin transfer molding is a moderate volume production process. Resin transfer molding uses male and female dies under vacuum to sandwich composite materials between them. After compressing the material, resin drawn through the compressed fibers permeates them. Resin transfer molding offers higher throughput rates than open molding but lower rates than compression molding. Applications: Resin transfer molding services can provide higher strength composite structures than open mold molding, with finished inside and outside surfaces.